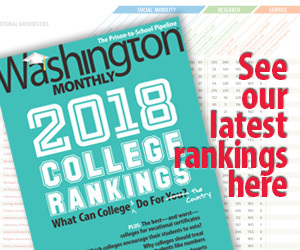 The Obama Administration’s two-year effort to develop a federal college ratings system appeared to have hit a dead-end in June, with the announcement that no ratings would actually be released before the start of the 2015-2016 academic year. At that point in time, Department of Education officials promised to instead focus on creating a consumer-friendly website with new data elements that had never before been released to the public. I was skeptical, as there were significant political hurdles to overcome before releasing data on employment rates, the percentage of students paying down their federal loans, and graduation rates for low-income students. But things changed this week. 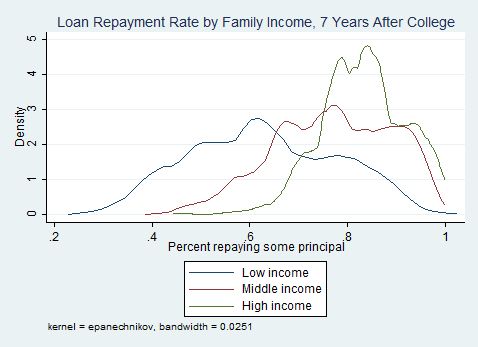 First, a great new paper out of the Brookings Institution by Adam Looney and Constantine Yannelis showed trends in student loan defaults over time—going well beyond the typical three-year cohort default rate measure. They also included earning data, something which was not previously available. But, although they made summary tables of results available to the public, these tables only included a small number of individual institutions. It’s great for researchers, but not so great for students choosing among colleges. The big bombshell dropped this morning. In an extremely rare Saturday morning release (something that frustrates journalists and the higher education community to no end), the Department of Education released a massive trove of data (fully downloadable!) underlying the new College Scorecard. The consumer-facing Scorecard is fairly simple (see below for what Seton Hall’s entry looks like), and I look forward to hearing about whether students and their families use this new version more than previous ones. 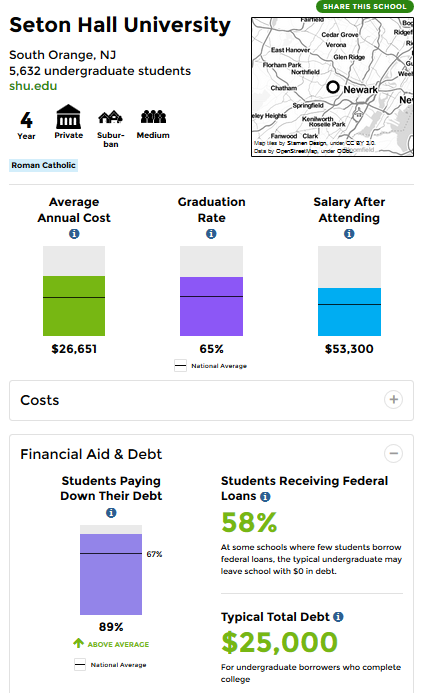 I also recommend ProPublica’s great new data tool for low-income students. Transfer rates: The percentage of students who transfer from a two-year to a four-year college. This helps community colleges, given their mission of transfer, but still puts colleges at a disadvantage if they serve a more transient student body. There are a lot of data elements to explore here, and expect lots of great work from the higher education research community in upcoming months and years using these data. In the short term, it will be fascinating to watch colleges and politicians respond to this game-changing release of outcome data on students receiving federal financial aid.